Dropping the F-bomb in Class Part 2: How? The real F-bomb associated with using Facebook in class is Fear. Essentially teachers FEAR that their privacy and the privacy of their students will be invaded, and they will suffer the consequences that come with that especially if you are teaching in the US. The reality, however is that these are not rational fears if you understand and know how to set up your Facebook groups properly. Today, all of our students are using social media platforms like Facebook, Instagram, and Twitter as their main form of communication. This can be incredibly dangerous because no one is teaching their adolescent brains how to carry out this discourse responsibly. Parents, for the most part are not participating on these platforms, and for those that do, they are blissfully unaware of their children's activities and level of vulnerability. Teachers frequently want to draw the line in the sand and avoid this level of intimacy with students, claiming it is not their responsibility. I am not one of these teachers. If all of the adults in our students' lives avoid engaging with students on this level, who is looking out for them? I care too much about my students to leave something this important to the uninformed (parents and peers) to guide my students on responsible use of a technology tool that has the potential to have such a huge impact on their future. I am an educator and my job is to educate and protect my students from their own ignorance until they are mature enough to handle that responsibility on their own and truly understand the consequences of their actions. Facebook groups are actually more private than most of the platforms offered at your school for student collaboration. The first thing you should do with your students is show them how to set their privacy settings so that the members of the group (read your teacher) will only be able to see what they want them to see if they are not friends with them on Facebook. Have your students open up their FB pages and click on the padlock in the upper right hand corner of their page. They then need to click on "who can see my stuff?". This will unfold the menu below. They should make sure that they have the who can see my future posts designated as friends only. At this point they might need to go back through previous posts/ pics and change the privacy settings on those individually. This is something every student should do anyway as I suspect the majority of them have not been smart about their FB usage. There is a new feature that allows you to see how others view your page. I would recommend that all of your students do this so that they know what a college recruiter, employer, teacher, parent, or friend can see when they look at their page. Since your students are most likely friends with all of the people in your class, the FB group will not change their current vulnerability. By ensuring that they simply select only friends can view future posts, you are protecting yourself from having to see something that might pop up on your homepage. Here is a good comprehensive article that you can share with your students about privacy settings. If you are still uncomfortable about students seeing what you post on your page, then create a separate account just for school. This however defeats the purpose of having all of your traffic going to one place, as you will have to log into a separate account to retrieve your messages. Now for setting up the group. There are several ways that you can do this. If you don't want to friend your students, then you need to designate one person (a friend, child, colleague etc.) 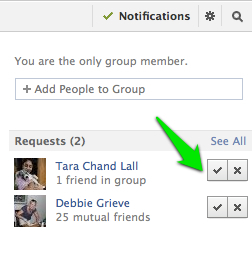 who is already your Facebook friend to set up the group. You can delete them immediately after creating your group. 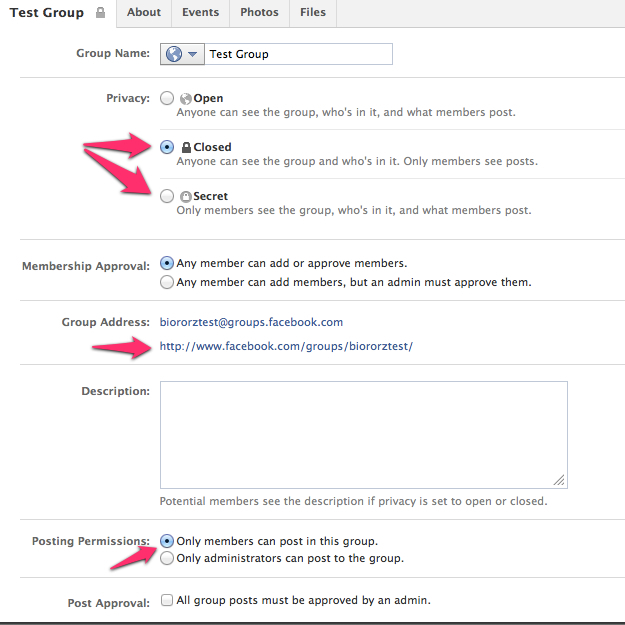 Step 1: In the left hand column of your home page select create group. This will bring you to the setup page. Here you need to name your group, choose one friend to create the group, and then choose your privacy setting. If you choose secret, no one will be able to find or join your group, so I recommend that you start with closed. Now click create! They will then give you the opportunity to choose an icon for your group and you are done. Once on your group page you need to set it up. The first thing you should do is click on the wheel and select "edit group settings", which will take you to the settings page (see pic to the left). Until everyone joins the group, you want to keep your settings as closed or open. Once all members have joined, you need to go back and switch it to secret. Most of the steps are self-explanatory, but you will need to create a URL for your group. It might take some time transfer from the temporary numerical URL you were assigned. This is the URL that you will use to share with your students, so you should do this in advance of class by at least an hour to be on the safe side. Now it is time to share with your students. The best way to do this is to have them check their privacy settings at the beginning of class and then share the URL. You can write it on the board, e-mail it etc. Have them request membership to the group and then you, as the administrator, will have to click on the check mark next to their request to accept them. Once all of your students have joined, you can change your privacy settings to secret and get started. You can also delete members or change roles etc. by clicking on the number of members (2 members in example pic). This will take you to your members page. 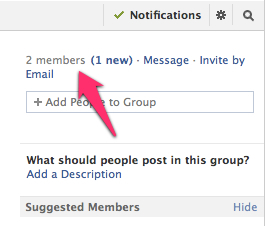 You then click on the wheel below the member's icon and you have the choice to either make admin or delete from group. Now you should be ready to go! Check out my previous post for some great ways to use Facebook groups in your classroom. By the way, I created a test group so that I could collect screenshots for this post. See if you can find it! It is called Biororztest and here is the link! I have the group set to secret, so happy searching!